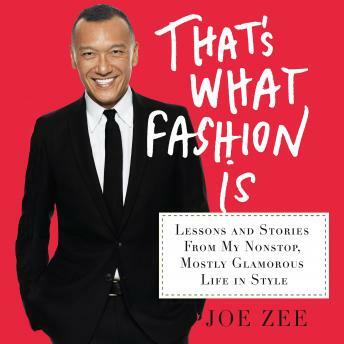 Joe Zee, the Editor in Chief of Yahoo Style, former creative director of ELLE magazine, and co-host of the new ABC talk show FAB Life, takes readers behind the scenes of the crazy and wonderful world of fashion in That's What Fashion Is. From his early years styling shoots for Vanity Fair's 'Hollywood' issue with famed photographer Annie Leibovitz to his role playing himself on MTV's reality show The City to making celebrities look fabulous in the pages of ELLE and reporting live from the red carpet, Joe lets listeners in on how the fashion industry really works, from the fashion disasters to the blockbuster successes. How do you shoot an entire magazine spread in Paris in 24 hours? What's a stylist to do when he receives a panicked call from a dress-less Cameron Diaz on Oscar day? And how do they make those celebrities look so great in the magazines? These first-person stories are combined with accessible and practical tips for women everywhere, including what to wear on your first day of work, how to take a great selfie, and how to look amazing at any age. For the first time, this ultimate fashion insider lets listeners in on tales, tricks, and tips previously known only to the fashion elite in this funny and frank audiobook.